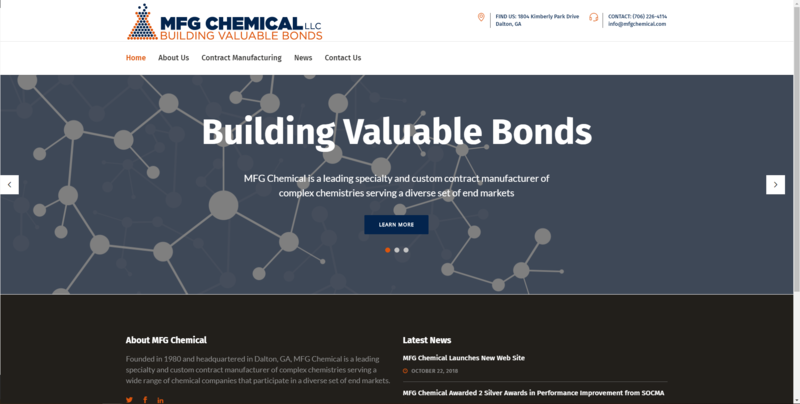 Dalton, GA (October 12, 2018) – MFG Chemical LLC, a global leader in specialty and custom chemical manufacturing has launched a new company web site. The new web site was created as a result of MFG’s recent and projected growth, and the adoption of a market-focused strategy. Earlier this year, MFG acquired a large chemical manufacturing plant in Pasadena, Texas, the company’s fourth plant. The newly acquired Texas plant occupies 25.7 acres, with 4 reaction trains, 16 current reactors ranging from 3,000 to 8,000 capacities, additional reactors being installed, and new product manufacturing capabilities. The Pasadena, Texas plant acquisition has catapulted MFG into one of the largest consumers of maleic anhydride and producers of sodium dioctyl sulfosuccinates (DOSS) in the US. MFG also manufactures water soluble polymers, non-aqueous polymers, amides, esters, imidazolines, surfactants, and produces many sophisticated reactions required in custom chemical manufacturing. The top markets served by MFG include agriculture, asphalt, food industry, graphic arts, paints & coatings, lubricants, mining, oilfield, personal care, pulp & paper and water treatment. Keith Arnold, CEO of MFG Chemical and Member of the SOCMA Board of Governors, commented, “We invite people to visit www.mfgchemical.com. MFG Chemical LLC is a leading specialty and custom chemical manufacturer for a variety of global markets. The company operates four manufacturing facilities with world-class product development capabilities in Northwest Georgia and Pasadena, Texas. MFG recently received two SOCMA Awards for plant safety and has achieved ISO 9001 – 2015 Certification. For more information, visit www.mfgchemical.com.